The Diving Well, Kootub [Delhi]. bl.uk > Online Gallery Home	> Online exhibitions	> Asia, Pacific and Africa Collections	> The Diving Well, Kootub [Delhi]. Part of a portfolio of photographs taken in 1858 by Major Robert Christopher Tytler and his wife, Harriet, in the aftermath of the Uprising of 1857. 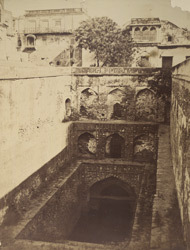 The Gandhak ki Baoli or steep-well, in Mehrauli was built by Iltutmish (r. 1211-36). It is supposedly named after the strong presence of sulphur (gandhak) in the water which was said to have tremendous healing properties. It is six storeys deep into the centre of the earth and was used to provide fresh water to the area.